The Golden Apple Award winner's motto is "Train up a child in the way he should go and when he is old he will not depart from it." 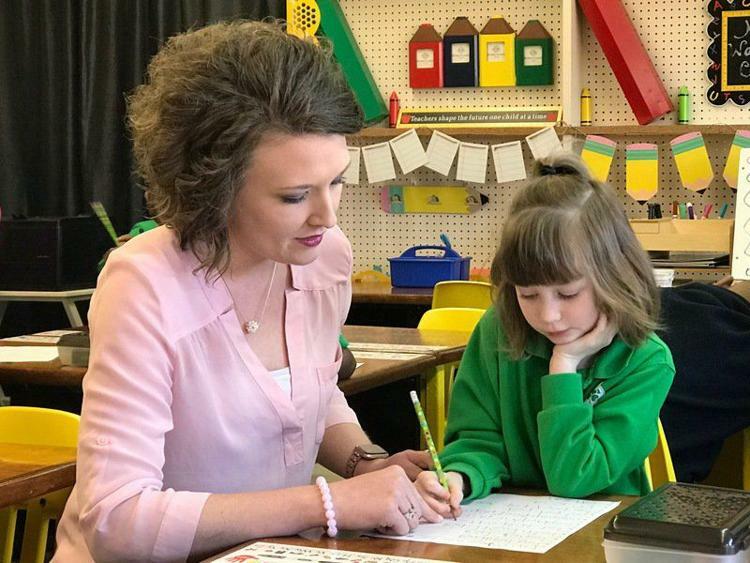 A Bible verse Lauren Walker said she always heard as a student at Calvary Christian School is one she hopes to fulfill as a kindergarten teacher at St. Patrick School in Meridian. "I had several phenomenal teachers when I was in school that just really inspired me to be the teacher I am today," Walker said. "They invested so much in me that I wanted to make a difference and give back – the way they made a difference in my life." 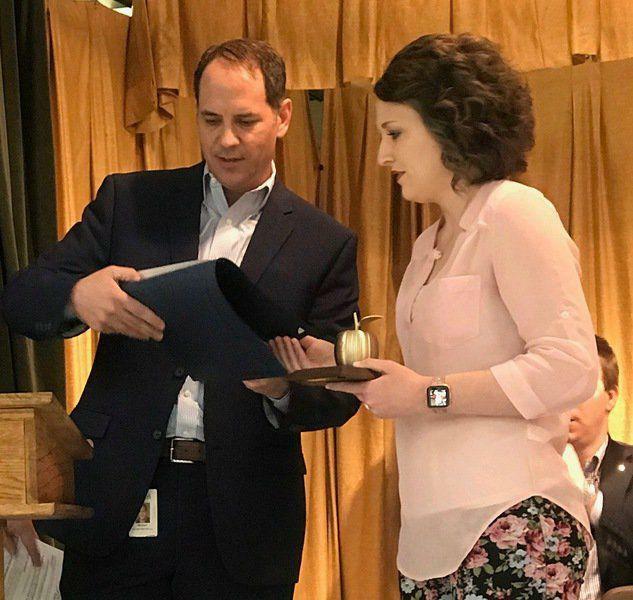 Because of her commitment and dedication to the profession she loves, Walker was surprised Wednesday to learn she had been chosen the Golden Apple Teacher of the month for January. "It is honestly amazing because I never thought I would get this award," Walker said. "But it goes back and shows me I am doing what I have been called to do, and I am making that difference that I wanted to make in each child's life." St. Patrick School Principal Montse Frias said when she thinks of Walker, and all she represents, she can't help but smile. Walker was nominated by a precious family that has an autistic girl, and you know it takes a special teacher to know how to take good care and make such an impact in a special student, Frias said. "She is a great teacher, very dedicated and we'll see her at St. Patrick several afternoons and weekends getting ready to give her best to her babies," Frias said. "She tries always to make her classroom special. During the holidays you know her classroom will totally change for the students to be excited. "She expects and gets the best out of her students – giving them the foundation they need to succeed." Walker said one of the biggest blessings of her life was when she started teaching kindergarten. "Kindergarten was the grade I always wanted to teach, but when I came to St. Patrick six years ago I taught third grade because it was available," Walker said. "As I finished my first year at St. Patrick School the kindergarten position became available. I decided to take it and it was one of the biggest blessings of my life. "After the first day, I was in tears because I just felt like this was exactly where I was supposed to be." When they grasp an idea – the light bulb moment, that's amazing, Walker said. "When you look in the eyes of a student and know that you got them to that point it is amazing, Walker said. "I believe teaching kindergarten is the foundation like building a house. I feel like I am laying down those first steps for them, making a positive, and making a difference in their life." St. Patrick School Kindergarten teacher Lauren Walker accepts the Golden Apple award at a surprise ceremony in her honor on Wednesday. Walker said kindergarten involves so much more than it did years ago, incorporating math, reading, phonics, writing, science and social studies into the curriculum. "Technology has changed as far as being able to use it in my classroom," Walker said. "I just recently got a Smart Board and we have iPads we use for various things." Seeing how creative the students can be is a part of the day Walker says she loves. "They love recess and taking out their Play-Doh – they love to make different things," Walker said. It shows me their creativity because everyone is so different. We do all kinds of activities like arts and crafts that we incorporate into our learning. "We do a lot of directed drawing, which is one of my favorite things because it really shows each students ability and their creativeness." Kindergarteners Anna Kate Pritchard and Pierce Newman both like the fact their teacher let them have a long recess and agree she's really nice. "She's hard enough on us, but lets us have a long recess and she's nice," Newman said. "She is a lot of fun, super nice, and super sweet," Pritchard said. "Give it your all, because I pour everything into this job," Walker said. "To me, teaching is not just a job you sign up for, it is a true call and passion. I invest everything I have into this job. Go in every day with a smile, you never know what is going to happen. "I love that no matter what is going on, when I come to work, there are 14 smiling faces waiting for me every day. I want my students to remember I made learning fun and exciting, and they didn't just come in and sit at a desk all day." What makes working at St. Patrick School so special to Walker? "We teach Jesus and we are able to teach the Bible every day," Walker said. "We can stop and pray whenever we want to. "It's not just about growing the child academically, we are growing them for the kingdom and to be outstanding citizens for the future."